FREDERICK, MD- A marathon contest saw the Frederick Keys (1-4) fall 8-5 to the Fayetteville Woodpeckers (2-3) in a 12-inning, rain delayed game on Monday night at Nymeo Field. The Woodpeckers took advantage of three walks and RBI hits from Corey Julks and Seth Beer to score four runs in the 12th and held Frederick to a lone run in the bottom half of the inning. J.C. Escarra led the Keys offense, going 3-for-4 with three RBIs, a double, and a home run. The two teams combined for 39 strikeouts, the most since the Buies Creek Astros and Carolina Mudcats combined for 39 back in June of 2017. Escarra's two-run home run gave the Keys a 2-0 lead in the first inning. In the fifth inning, Colton Shaver blasted a solo home run to cut the lead to 2-1. Seth Beer tied the game at 2-2 with an RBI single in the sixth inning, but the Keys would retake a 3-2 lead after Jake Ring singled, stole a base, and advanced on two wild pitches. Jacob Meyers responded in the eighth with an RBI double to tie the game 3-3. It was Meyers again in the top of the 10th inning who scored the go-ahead run by beating out a potential double-play ball to make it 4-3. Escarra tied the game 4-4 in the bottom of the inning by hitting home pinch-runner Willy Yahn from second. Keys starter Cody Sedlock was solid in his season debut, giving up just two hits, two runs, and two walks while striking out a career-high nine batters in 5.2 frames. Steven Klimek and Cameron Ming pitched a combine 4.1 innings with eight strikeouts and just four hits. Travis Seabrooke (0-1) took the loss after walking the first two hitters in the 12th inning who eventually scored. Fayetteville starter Peter Solomon had a career-high 11 strikeouts in 4.2 innings of work. Hunter Martin (1-0) allowed one run in three innings to earn the win. 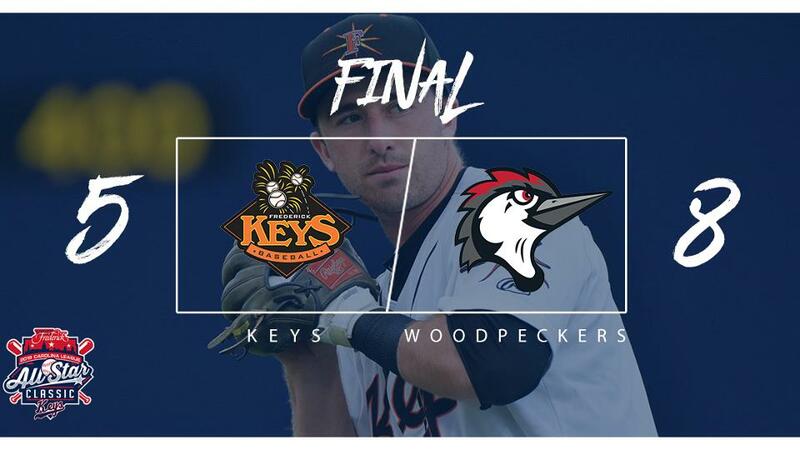 Game two of the three-game series between the Keys and the Woodpeckers is scheduled for Tuesday, April 9 with first pitch at 7 p.m. RHP Brenan Hanifee (0-1, 13.50 ERA) will take the mound for Frederick while RHP Bryan Abreu (0-0, --) will make his season debut for Fayetteville. Pregame coverage begins at 6:45 p.m. on frederickkeys.com and the TuneIn radio app. For a complete look at the 2019 Keys promotional schedule fans can visit frederickkeys.com.